The Clearinghouse’s comprehensive reporting process covers all aid recipients (federal and private), helping to prevent students from being overlooked. Schools and their students benefit from faster, more timely reporting and deferment form processing that also enables greater accuracy and fewer errors. As your authorized agent, the Clearinghouse provides status and deferment information to the Department of Education’s NSLDS (National Student Loan Data System), guaranty agencies, lenders, and servicers on your behalf. Periodically, you need to report the enrollment status for all your students to the Clearinghouse via secure FTP according to your school’s transmission schedule. If you participate in our free DegreeVerify service, you will also report your degree data to us. Also see out blog post G from DV – Better Than Before. Another way that the Clearinghouse completes compliance reporting for your school is via weekly notifications for non-Direct Loans. Evergreen. You enter a schedule for one full academic year and we automatically generate a new one for you every year. Report ACDs for students with F, Q, H, L, and A enrollment statuses. Do not report ACDs for students with W, G, or D statuses. If you are unsure when a student is expected to graduate, we recommend you report the ACD using the current term end date plus one year to avoid the student entering repayment too early. Do not report the student’s ACD as occurring more than 10 years after the certification date of your enrollment file. This can trigger NSLDS error #16 and cause NSLDS to not accept the record. Review ACDs at least once every term to ensure the dates for all enrolled students (those with F, Q, H, L, and A statuses) are calculated and reported accurately. Typically, the ACD calculation is based on the number of credits completed and the total number of credits required for graduation or program completion. You can see the average processing turnaround time for enrollment and degree files submitted to the Clearinghouse by selecting the “Student Reporting” tab of our secure website. This information is also displayed when you select the “Enrollment Reporting” and “Degree Transmissions” links on the tab. A Student Status Confirmation Report (SSCR) is a roster of students who have Title IV loans or grants disbursed by your school. The roster is populated by your school when your financial aid office enters information into the COD (Common Origination Disbursement) system to start the loan process for your students. Once the information is entered into COD, it is transmitted to NSLDS, which populates the roster. The student roster is then sent to the Clearinghouse, who as your institution’s authorized agent, responds to the rosters. The response the Clearinghouse sends is comprised of the most recent information your school reported in your enrollment transmissions. How often does the Clearinghouse respond to Student Status Confirmation Reports (SSCRs)? The Clearinghouse schedules and processes a Student Status Confirmation Report (SSCR) every month for each of our participating schools. Typically, each roster is received from the National Student Loan Data System (NSLDS) around the first day of the month and processed within 15 days of receipt, per guidance from Dear Colleague Letter 14-07. How often is enrollment reported to the Clearinghouse? Each institution that participates with the Clearinghouse has a unique enrollment reporting schedule, tailored to its academic calendar. The Clearinghouse recommends reporting at least every 30-45 days, and submitting First-of-Term enrollment files within about three weeks of your institution’s term start date. This timeframe helps ensure your institution’s compliance with federal requirements. What is the timeframe for reporting to NSLDS? Is it 30 or 60 days? The regulations published by the Department of Education require that institutions complete and return their Student Status Confirmation Reports (SSCR) within 15 days of receipt. Not to worry, sending your data to the Clearinghouse in a timely fashion and following the guidelines for your planned transmission schedule and error resolution enables the Clearinghouse to complete this requirement on your school’s behalf. The other portion of the regulations state that an institution must report a student status change whenever a student drops below half-time (i.e., less than half time, withdrawn, or graduated) within 60 days of determining the status change. You can report the status change via another SSCR, if your school plans to send one within 60 days. The NSLDS Enrollment Reporting Guide notes that schools must report enrollment information at least every 60 days. Do SSCRs go out at least every 60 days? Yes. The Clearinghouse schedules and processes a Student Status Confirmation Report (SSCR) every month for each of our participating schools. Each roster is typically received from the National Student Loan Data System (NSLDS) around the first day of the month and is processed within 15 days of receipt, per guidance from Dear Colleague Letter 14-07. How does the Clearinghouse know who to send my enrollment data to if the information is not requested through the SSCR process? While the Clearinghouse primarily serves school clients, our participants also include members of the education finance community. These organizations provide the Clearinghouse with their borrower portfolios, typically monthly. 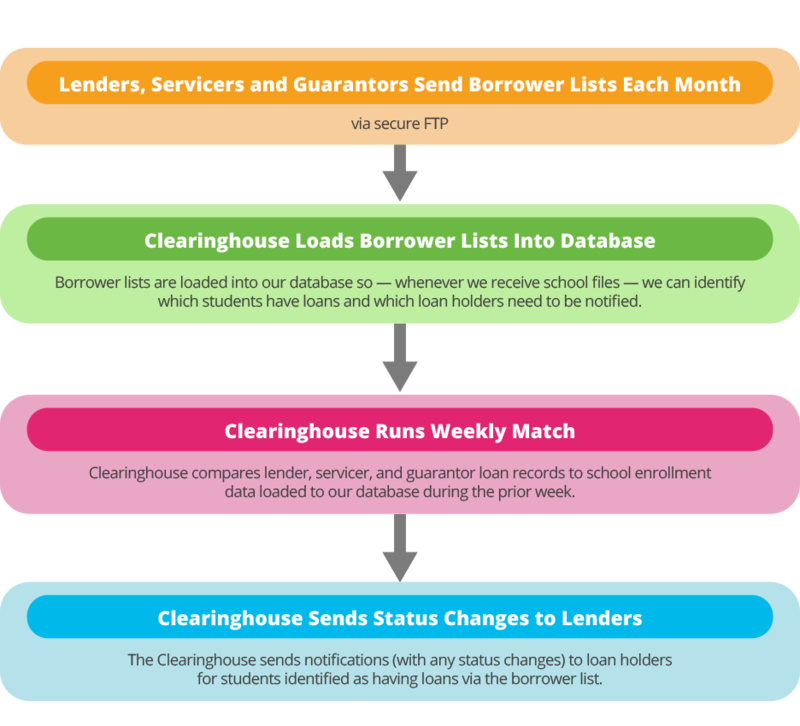 The Clearinghouse uses the student borrower lists to identify which lenders, servicers, and guarantors need to know about specific students’ changes. 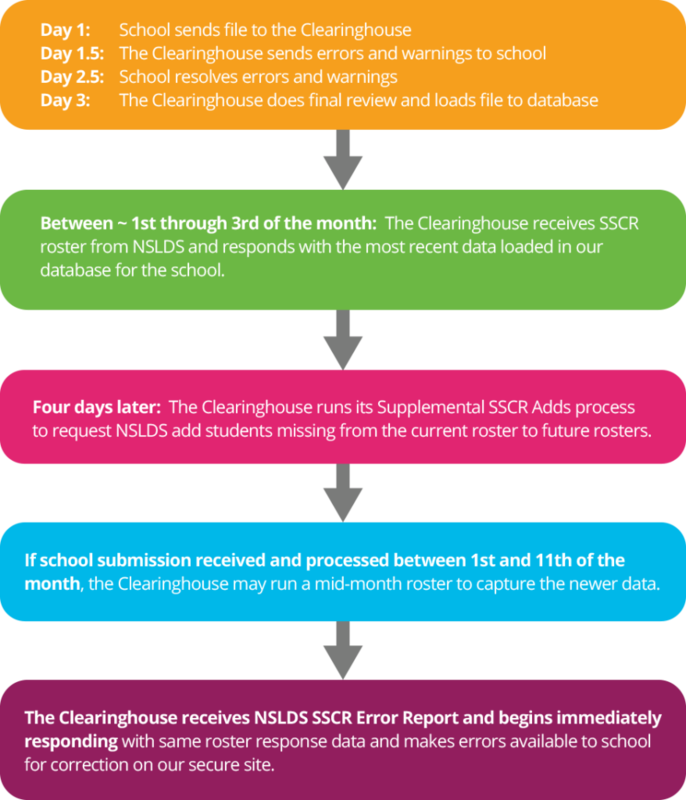 How can I view enrollment reporting completion through the Clearinghouse website and NSLDS? How should my school report unofficial withdrawals through the Clearinghouse to NSLDS? Use the online update feature via the Student Look-Up tab on our secure site. Schedule an enrollment file that contains the withdrawals. We recommend you report unofficial withdrawals as soon as possible. If a student re-enrolls after an unofficial withdrawal, it is important to remember that you must capture both the withdrawal and the enrollment. Our new online SSCR Error Correction system is now live! It’s critical that you report an accurate Anticipated Completion Date (ACD) — also commonly known as the Anticipated Graduation Date or AGD — for each student for whom it is required.